More than 200 enthusiastic girls flocked to Perth Modern School last week to participate in the West Coast Eagles’ inaugural free female football clinic. Designed to pique the interest of girls not playing the game at present, the clinic featured five stations that focused on developing kicking, handballing, tackling, marking and gameplay skills. 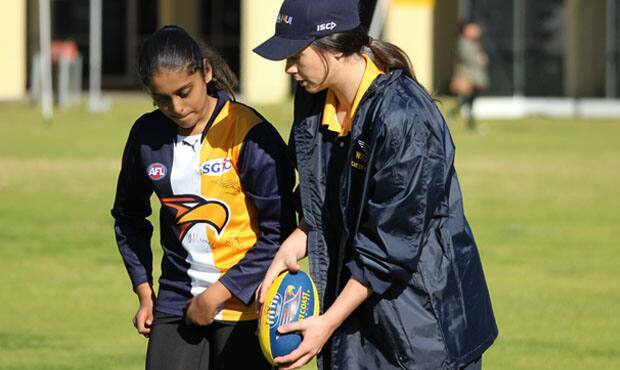 West Coast Eagles game development manager Adam Selwood assembled some of Western Australia’s finest female football talents to coordinate two hour-long sessions for girls aged between 10-13 and 14-17. “My engagement with the female pathway helped me recruit some key WA female players and coaches to help out at the sessions,” Selwood said. “They did all the coaching and they passed on all the tips. They were those girls once upon a time, so they were really motivated to give back and help out West Coast, which is fantastic. Selwood said he was very impressed with the level of talent on display at the clinic. However, he emphasised the clinic was not coordinated to identify potential AFLW players. “West Coast’s contribution to the development of women’s football is not just focused on the high performance aspect, but grassroots too,” he said. “It is really important that we are assisting at all levels and encouraging girls not only to become AFLW players, but to simply play and enjoy the game in the company of friends. “It was a great day and we had a lot of great feedback. All the girls got a gift pack that included a hat and drink bottle and they’re all now signed up for our female academies. The feedback from all the coaches is they want to keep coming back and supporting the club. All the clinic's participants threw their support behind West Coast's bid for a 2019 AFLW team!